This is a harbor that, like so many, has gone from gritty industry to bourgeois amenity. 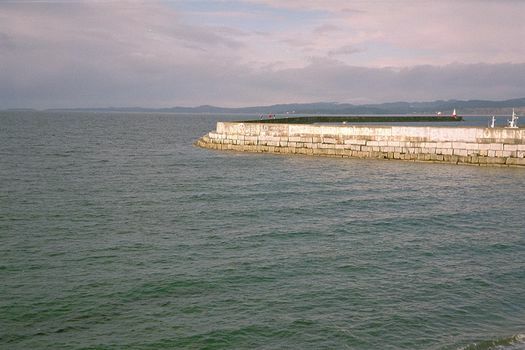 Turning into the harbor--closed to the left foreground but opening to the sea around the point. 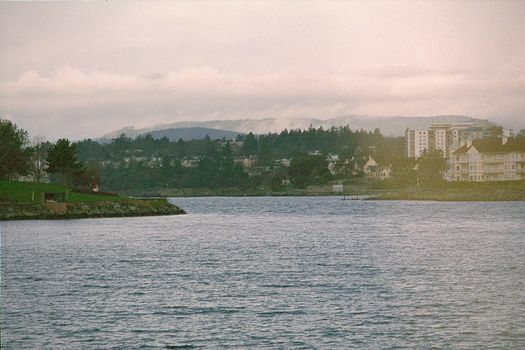 This is not the entrance to the famous Esquimalt navy base, which is farther west, but rather to Victoria's own harbor, hardly used by freighters but of huge amenity value, as the highrise apartment suggests. 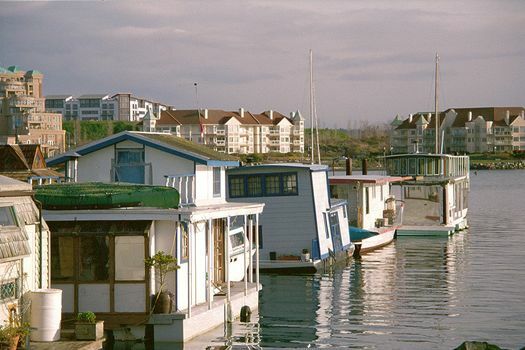 Despite waterfront condomania, there's still room for houseboats. "And once again, Shoal Point has proven to be the popular choice by discerning judges from coast to coast." 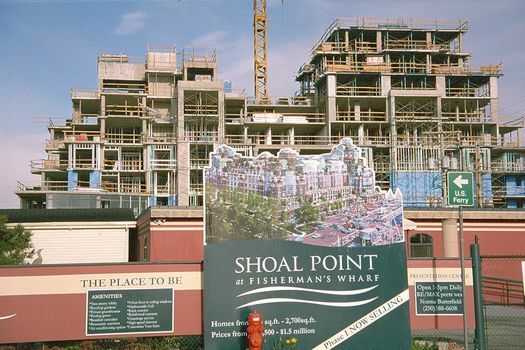 That's the text from an ad, and it refers to Shoal Point's "project of the year" award in 2003 from the Canadian Home Builders Association. Continuing to the right into the Inner Harbour. Beyond the Johnson St. drawbridge lies a chain of waters--Upper Harbour, Selkirk Water, The Gorge, Portage Inlet--that have been a recreational attraction and a real-estate focal point for a century. 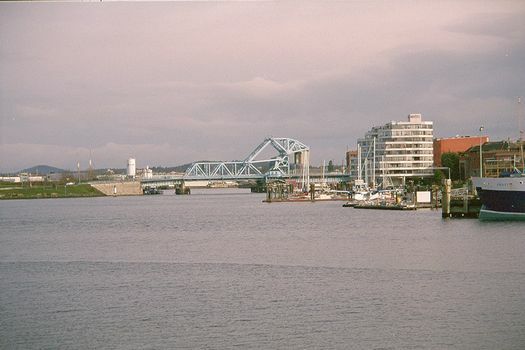 To the right lies James Bay, a stubby extension of the Inner Harbour. Stubby it may be, but it's thick with tourist-focussed developments, including a batch of hotels. The B.C. 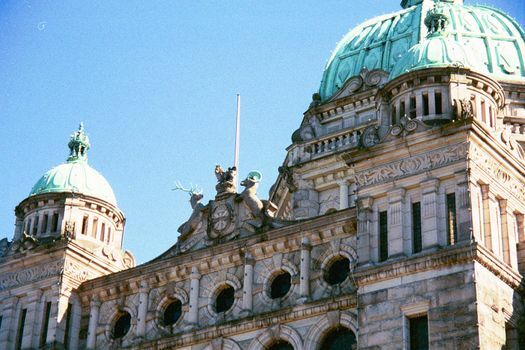 parliament buildings are at the end of the stub and have managed to hold their own against importuning developers. At the far right, mid-height, there's a statue of the lady herself. 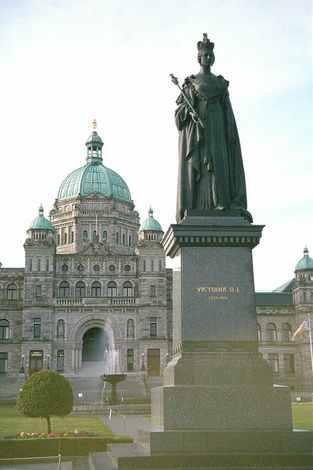 Victoria, R.I. Queen-Empress. 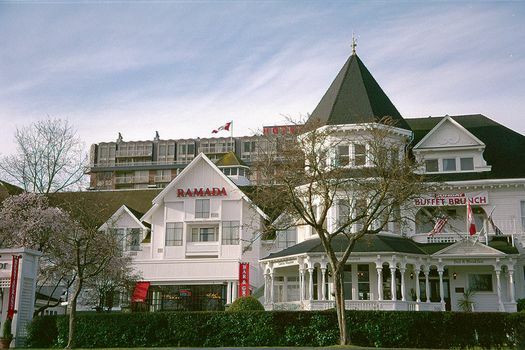 And if one turned left, one would see the Empress Hotel, named for her at a time when the Canadian Pacific not only ran trains and hotels but also steamships across the Pacific to places where other such statues stood in warmer climes. 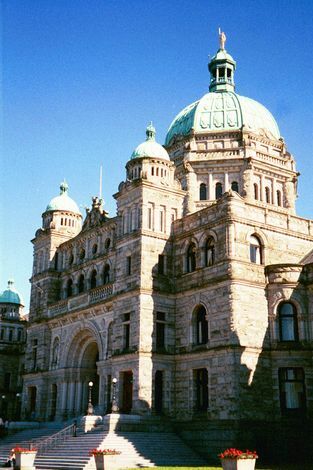 Entry to the parliament buildings. 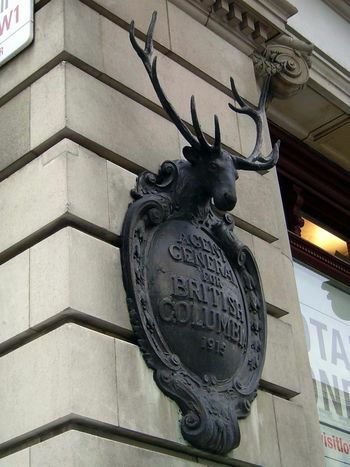 Detail showing the deer and ram symbolizing the once separate colonies of Vancouver Island and British Columbia. 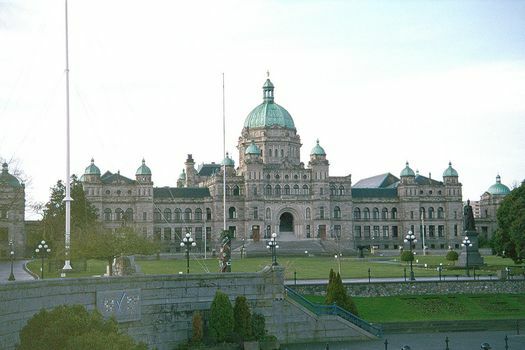 From the Parliament Building toward the water and, on the right, the Empress Hotel. 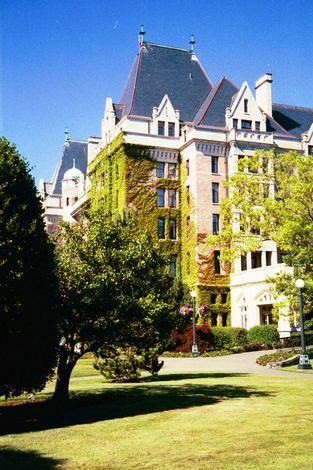 The hotel trades on its facade and reputation. Inside, it's been much reduced, though there is still a Bengal Room serving curries. 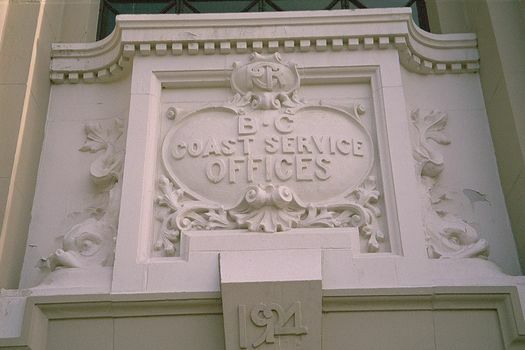 Across the street, there's the former office of the Canadian Pacific's coastal steamers, modest sisters of the company's ocean liners. The steamers were named after princesses; the liners, after queens and empresses. Not to get dizzy, but we've jumped just for this one picture to London's Trafalgar Square to look at this relic, still attached to what was once the province's London office. From the perspective of Canadian Pacific's steamship operations, in other words, we're at the other end of the line. 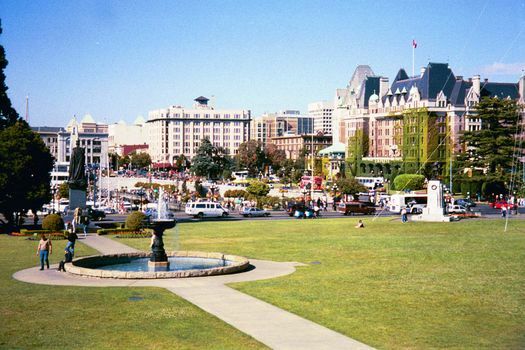 Back in Victoria, most of the downtown, which extends north from James Bay along the Upper Harbour, has been thoroughly upgraded. 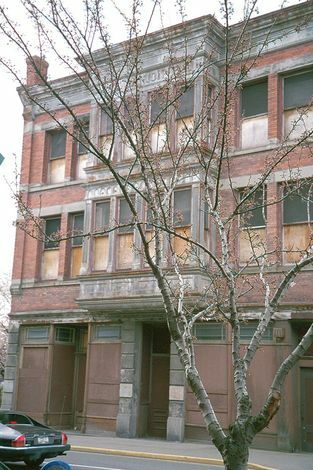 Here and there, though, there are buildings frozen since the 1960s, when the whole neighborhood was in decline.